The Manufacturers Life Insurance building (Manulife) was is situated at 200 Bloor Street East in Toronto. With construction completed in 1925, the original structure had 8 stories, and in 1953, an additional 12 stories were built; keeping the original architectural concept in mind. The ground are kept immaculate and is one of Toronto’s most beautiful buildings. The Manulife Building has always been one of my favorite buildings in Toronto. I remember driving past it, with my Dad, as a child. We were making our way to the St. Lawrence Market or some destination like that. I remember it being more “blackened” but over the years, sandblasting and other maintenance has brought her back to her pristine beginnings. Manulife has several different themes during the year. The grounds are are transformed to pay tribute to events in history such as Canada’s long standing support to her allies in wars. 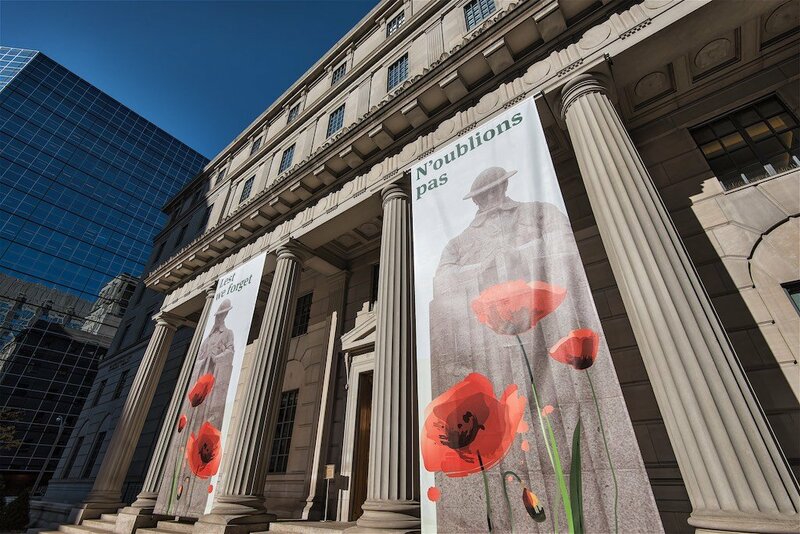 Every year, Manulife shows respect to those that have fallen in World Wars. Many Manulife employees have been part of that since Canada was a country. On November 5, 2015, Manulife planted 11,843 Canadian flags in tribute to fallen Canadian soldiers. 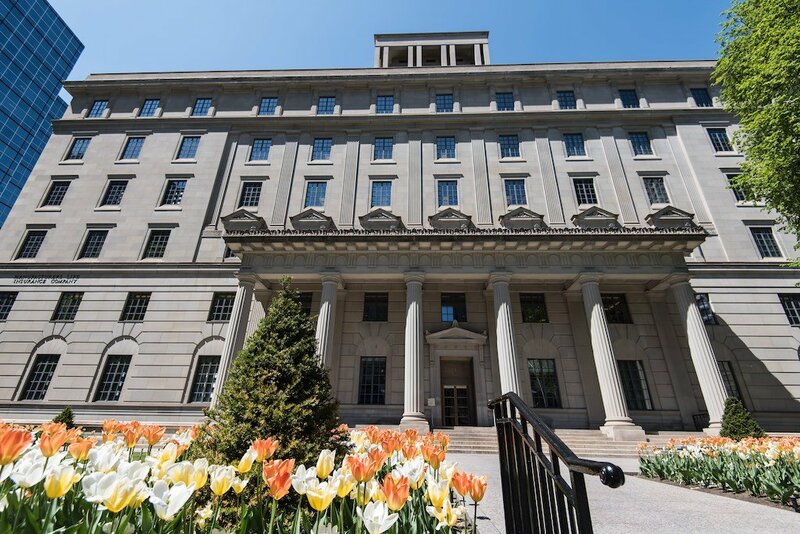 It is held at Manulife’s Head Office, at 200 Bloor Street east, in respect to the 118,000 members who lost their lives during peacekeeping missions around the world. It is a touching tribute and exemplifies Canada’s contribution to freedom. Currently, the Manulife Building has a Spring Theme showcasing orange, red and white tulips. Spring was a bit late in Toronto this year but it finally came after a very mild winter. This Toronto landmark can be rented out for events during the weekends. Some use it as a venue for wedding photography and other related events. The Manulife building is one of Toronto’s best architectural structures which still stands today. One of its founding fathers was George Gooderham who was a renowned international businessman in the distillery trade. He had his hands in various business affairs and is a forgotten Toronto great. 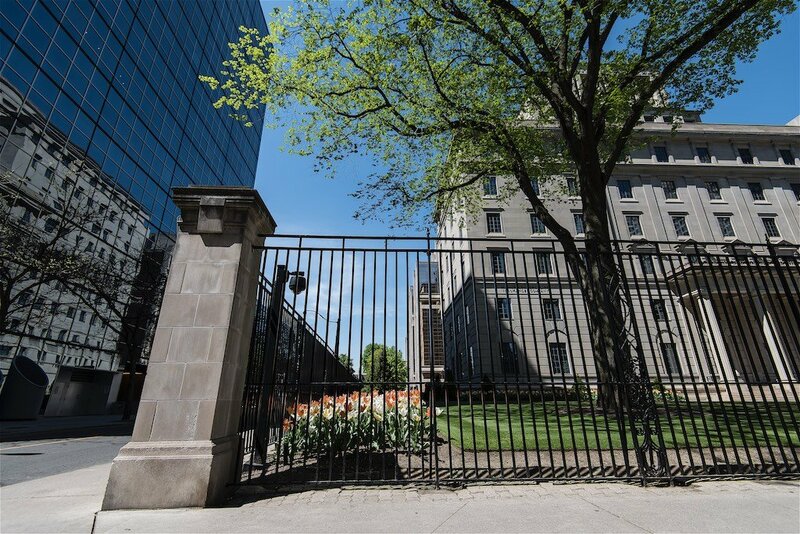 This entry was posted in Architecture and tagged Gooderham memorial war, Manulife building toronto.